If you want to increase your safe’s functionality and storage space with a minimal investment, you should think about buying a door organizer. 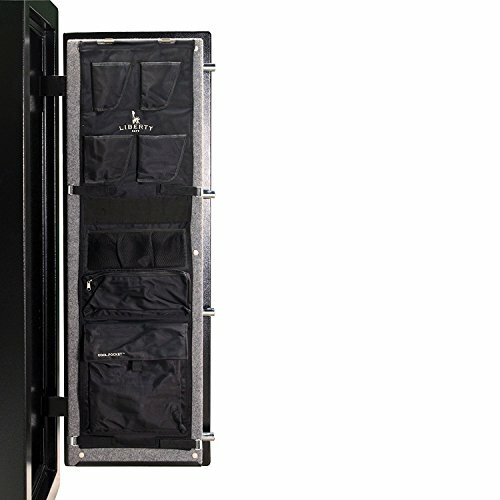 The best gun safe door organizers can hold multiple handguns, magazines, and ammo pouches, maximizing the storage space available on the safe’s shelves. Besides extending the safe’s storage space, using door organizers can enable you to organize your items and to keep the items you use more frequently close at hand and easy to find. Using safe organizers are is a cheap and effective way to extend your safe’s storage space and to increase your safe’s practicality. Without further ado, let’s take a look at some of the best models available today and the benefit of using one. Dimensions : 11.1 x 2.5 x 1.3"
Dimensions : 18 x 2 x 48"
Dimensions : 26.5 x 10.2 x 4"
Dimensions : 3 x 19 x 49"
The handgun hangers developed by Safety Storage give you the possibility to organize your pistols underneath the safe’s main shelf. Not only will using these hangers allow you to save storage space by placing up to 6 pistols under the shelf, but it will also allow you to store the handguns upright, making them easy to grab in the case of an emergency. These hangers are designed to fit handguns that have an overall length of maximum 10 inches, and they will fit shelves that are less than an inch thick. The hangers are coated, and they won’t scratch the surface of your pistols. 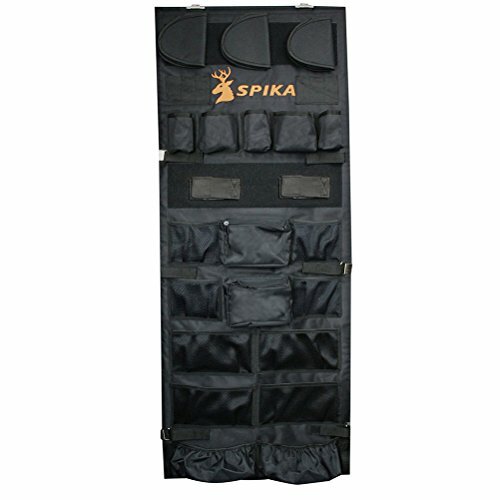 The SPIKA door organizer will fit on most medium safe doors, but you should measure the width and the height of your safe’s door before buying it. This door organizer comes with all the hardware you need for the installation, and the installation process is very easy. Installing the door organizer shouldn’t take more than 5 minutes. As far as the organizer’s storage space is concerned, this model can hold 2 guns, 3 handguns, and it also offers 2 medium zippered pockets you can use to store ammunition or magazines. No Tools Installation – The door organizer will simply clip on your safe’s door, so you don’t have to use any tools. Doesn’t Move – The organizer doesn’t move when you open or close the safe’s door. Quality Control Problems – Some items are delivered without all the accessories. However, the manufacturer sends them once you let them know which accessories are missing. The SnapSafe Door organizer will fit on the doors of many safe models. 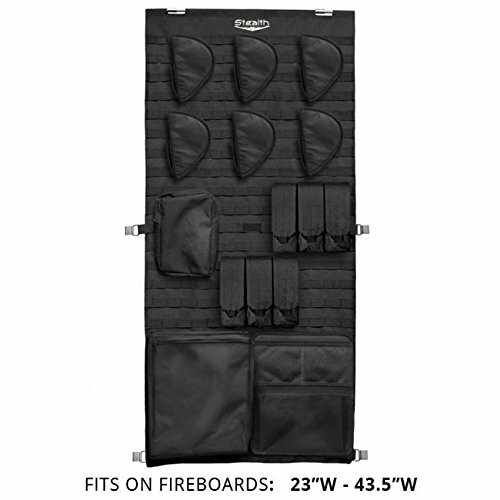 This organizer comes with 6 handgun baskets you can use to either store handguns or anything else that might fit, such as ammunition pouches or magazines. This model is easy to install, and the whole installation process shouldn’t take more than a few minutes. One of the things we liked about this door organizer is that it comes with slightly flexible baskets which can be adjusted according to your needs. The baskets are coated in rubber, so they won’t scratch your handguns. Good Rubber Coating – The door organizer is coated with a rubbery material, so it won’t scratch your pistols. Good For Most Semiautomatic Models – The baskets are large enough to fit most semiautomatic handguns. The Stealth door organizer is fully adjustable and customizable, and it comes with all the hardware you will need for the installation. One of the things we liked about this model is that it’s completely adjustable, so you can optimize the storage space in your safe. The organizer is MOLLE-compatible, and every pocket can be placed in different places, depending on your needs. This door organizer comes with 6 pistol holsters, a large pocket, a medium-sized pocket, a netting pocket, and 2 triple magazine pouches. Being MOLLE-compatible, the door organizer will also hold any MOLLE holsters you already own, further increasing the safe’s storage space. Highly Adjustable – You can move each of the pockets on the organizer’s surface. Bottom Clips Could Be Better – The organizer comes with two bottom clips, but those will not keep it close to the door once you load all the pockets. This is a gun safe organizer for the large gun safes. It has plenty of pockets for whatever you might want to store. 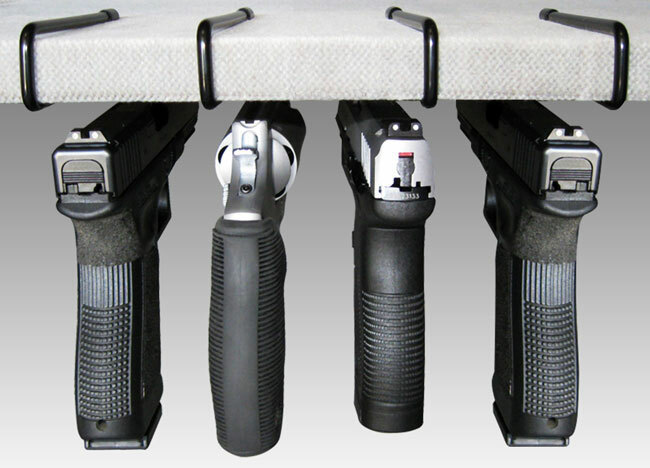 It is also equipped with four pistol holsters which will make your weapons easier to access. You can purchase more pistol holsters for the organizer. It also has compartments for your ammo, so it does not spill into the safe. It will also allow you to put separate your ammo by caliber. This organizer will mount to the inside of steel or drywall gun safe doors. The mounting brackets are included. Comes with different size clips so it can be mounted in any large gun safe. Has many pockets so you will have room for all your valuables to be stored in the safe along with your weapons without causing clutter. You have a little decision on where you want your pistol holders located. Many people do not use them, but you can also store two rifles in the door organizer. Many other gun safe organizers are bland and have pockets that don’t allow you to see the contents. This organizer has a few clear pockets for you to store the small things you have to access quick or the things you use most often. The holsters cannot be placed in a position where they can be accessed with either hand. Left-handed people will have to adapt to obtaining their gun with their right hand. If you use the rifle storage in the organizer, it will keep you from accessing some of the pockets. 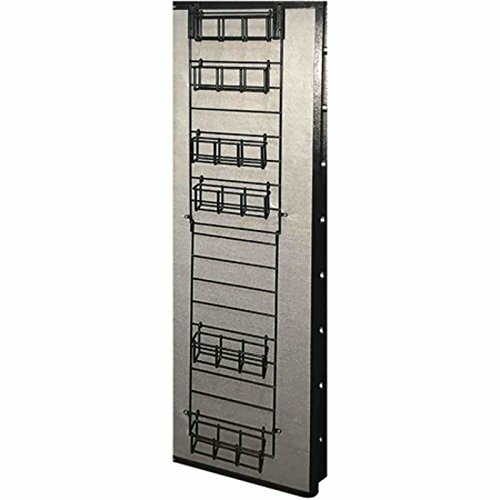 This is a highly rated gun safe door organizer. It is equipped with four quick draw holster like many other organizers. It has features that are unique too. It is fitted with a cool pocket. The cool pocket is fireproof and will be useful for storing important documents. Is equipped with a cool. The cool pocket is fireproof. This gives the contents of the pocket an extra layer of security if your safe is also fireproof. This organizer is easier to install than others that are on the market. It has hooks for each side of the safe when you pull the straps to tighten it against the door. It will allow you to store your pistols in the organizer so you can clear some shelf space if needed. This organizer will allow you store your pistol and holster depending on what size the holster is. Has elastic bands for you to store extra magazines instead of actual magazine holders. Some people have run into the problem that the hooks that are included with the safe would not work on their gun safe. If you run into this problem, you can use screws to hold the organizer in place. If you have a vertical divider in your safe, it might cause your safe not to close if the cool pocket is full. I recommend you put the most important valuables in the cool pocket, so you do not run into this problem. Sometimes the hooks will not allow your safe to close as tight as it should. When you run into this problem, you can push the hooks back into place, and it will allow your safe to close properly. Gun safe doors organizers can extend the storage space of your safe significantly. But are there any other benefits of using an organizer? Let’s take a look. Store Your Most-Used Items In Easy Reach – One of the benefits of using a door organizer is that you can use it to store your frequently used items. Whether it’s your daily carry handgun, or one or two extra mags, keeping them within easy reach can be an advantage. Stores Your Handguns Upright – Some door organizers will store your handguns in an upright position, making it very easy to grab them when you’re in a hurry. Being able to reach your pistol quickly can be a great advantage in some situations. Increases Your Safe’s Storage Space – Door organizers can significantly increase your safe’s storage space. Models like the Stealth MOLLE Door Organizer can store up to 6 handguns and plenty ammunition mags, so they can really clear up valuable storage space on your safe’s shelves or bottom. The door organizers that are MOLLE-compatible can actually accommodate all your MOLLE accessories. This will further increase the safe’s storage space. Ease Of Installation – Most safe door organizers are easy to install. Instead of using bolts, screws, and screwdrivers for the installation, these models come with attachment clips. The clips will secure the organizer to your safe’s door, making the installation quick and easy. Even though they might not seem like much at a first glance, the attachment clips usually do a great job at securing the organizer on the door. However, there are some models that will require you to drill holes into the safe’s door, and that might at times be more difficult than it sounds. Adjustable – Since most door organizers are designed to be compatible with many safe models, they have to be somewhat adjustable. 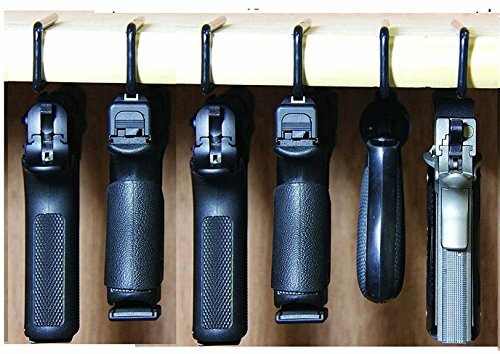 The best door organizers are fully adjustable, so you will be able to determine which of their pockets you’ll actually use, and where to place each pocket and holster. Using an adjustable safe door organizer is an advantage because it will allow you to use the safe’s and the organizer’s storage spaces at their maximum extent. Every pocket or holster the organizer comes with will take up some space. Sometimes the pockets are placed right where the safe’s shelves are, so the door won’t close any longer. Moving the pockets on a different spot on the organizer’s surface will eliminate these problems. Fit Most Handguns – Even though most door organizers won’t fit any rifles or shotguns, they’re designed to fit most handguns. Despite their small size, your handguns can take up valuable storage space, so storing them on the door instead of the safe’s shelves can significantly increase the available storage space.